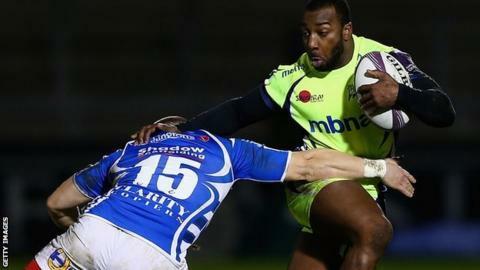 Sale Sharks eased past Newport Gwent Dragons to qualify for the European Challenge Cup last eight as Pool Two winners and earn a home quarter-final. The match was all-but won in the first half, as Brian Mujati and Josh Beaumont tries either side of a penalty try gave Sale a commanding 24-0 half-time lead. Danny Cipriani capped a fine display by putting Nev Edwards over before Ashton Hewitt scored a Dragons consolation. Full-back Mike Haley added a late fifth try for Sale, who were always on top. Dragons, who had already qualified for the knockout stages, will now face an away tie in the last eight. Sale fly-half Cipriani, who was overlooked by England boss Eddie Jones in his first Six Nations squad, impressed with a flawless kicking display that delivered 11 points as well as his classy assist for the fourth try. Cipriani kicked the resulting penalty after Dragons' Hallam Amos was shown a yellow card for a deliberate knock-on after 10 minutes and South Africa prop Mujati crossed in the corner soon afterwards. Sale then took control when they were awarded a penalty try after several Dragons infringements at the scrum, before captain Beaumont - who won the man of the match award to cap off a fine few days which has seen him included in England's Six Nations squad - powered over just before the break. Cipriani's fine grubber kick and raking pass to set up wing Edwards' second-half try secured the bonus point for Sale and mathematically ensured a home tie in the first knockout phase. Dragons' first well-executed set-piece led to Hewitt's consolation try, but Geraint Rhys Jones missed the conversion. Sale pressed for a fifth and were rewarded late on as Haley had time and space to touch down to complete a dominant win. Dragons: Geraint Rhys Jones; Ashton Hewitt, Adam Hughes, Adam Warren, Hallam Amos; Jason Tovey, Sarel Pretorius; Phil Price, Thomas Rhys Thomas (capt), Brok Harris, Cory Hill, Rynard Landman, Lewis Evans, Nic Cudd, Taulupe Faletau. Replacements: Elliot Dee, Boris Stankovich, Shaun Knight, Matthew Screech, Ed Jackson, Charlie Davies, Angus O'Brien, Nick Scott.